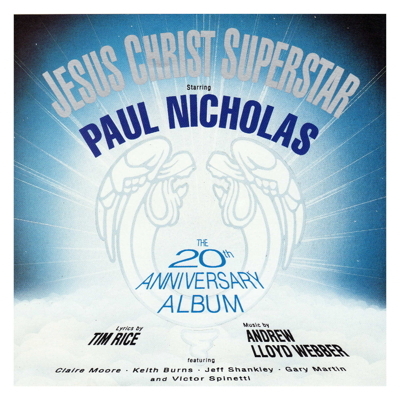 The 20th Anniversary Recording starring Paul Nicholas, Claire Moore, Keith Burns, Jeff Shankley, Gary Martin and Victor Spinetti. AVAILABLE ONLY AS A DIGITAL DOWNLOAD. 1. Overture 2. Heaven On Their Minds 3. What's The Buzz 4. Strange Thing Mystifying 5. Everything's Alright 6. Jesus Must Die 7. Hosanna 8. Simon Zealotes 9. Poor Jerusalem 10. Pilate's Dream 11. The Temple 12. Everything's Alright (Reprise) 13. I Don't Know How To Love Him 14. Damned For All Time 15. Blood Money 16. Betrayal 17. Last Supper 18. Argument 19. Gethsemane 20. Betrayal/Arrest 21. Peter's Denial 22. Pilate & Christ 23. Herod's Song 24. Judas' Death 25. Trial & 39 Lashes 26. Superstar 27. Crucifixion 28. John 19:41 29. Could We Start Again Please?